Every April, people throughout North, Central, and South America celebrate Pan American Day. The roots of Pan American Day go back to 1890, when the First International Conference of American States convened to establish the International Union of American Republics, an organization that would strengthen the bonds of friendship, mutual understanding, and respect for diverse cultures and peoples. In 1930, the 24 countries of the Pan American Union’s governing board adopted a resolution to commemorate that first meeting and reinforce the common bonds and mutual goals established to promote goodwill between the countries of the Western Hemisphere; Pan American Day was born! A few years later, in his 1933 inaugural speech, President Franklin D. Roosevelt promoted the importance of the Good Neighbor Policy, recognizing the United States’ need for strong personal, political, and economic relations with its southern neighbors. When Roosevelt delivered his speech, few would have guessed that, just a few years later, Donald Duck would become an "ambassador at large" to facilitate U.S. policy. 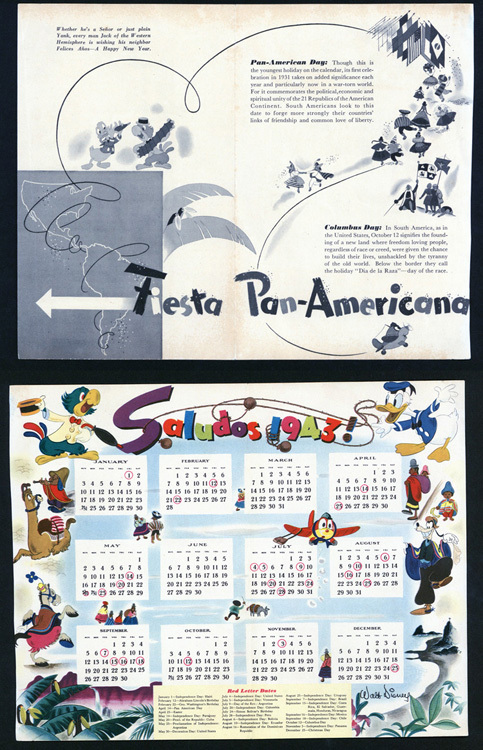 "Fiesta Pan Americana" flyer, put out by Disney Company, promoting the Good Neighbor Policy and referencing our shared holidays—Pan American Day and Columbus Day. The 1943 calendar is bordered by Disney characters that starred in the 1943 film "Saludos Amigos," including the star of the cartoon shorts, Donald Duck. As a diplomatic strategy, the Good Neighbor Policy increased in importance in the years leading up to World War II due to the rising influence of the Nazi regime throughout Europe and its attempts to make inroads into Central and South America, especially Argentina. As the Nazi propaganda machine became a serious threat to the Allied powers, the United States was compelled to develop its own campaign to strengthen support for South America. To develop closer economic and personal relationships, Roosevelt established a new agency, the Office of the Coordinator of Inter-American Affairs. Nelson Rockefeller was appointed as the new agency’s head but, in time, the affable Donald Duck would become the agency’s most successful spokesman. 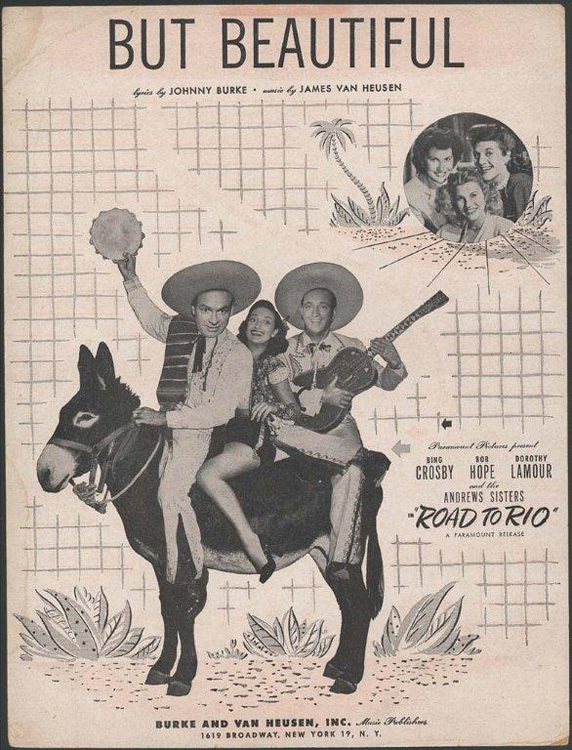 Sheet music for song from the 1947 film "Road to Rio," one in a series of popular movies starring Bob Hope, Bing Crosby, and Lana Turner. From the early 1930s to the 1950s, Hollywood increased the number of movies featuring Central and South American stars, themes, locations, and stories as part of a diplomatic gesture toward the Good Neighbor Policy. 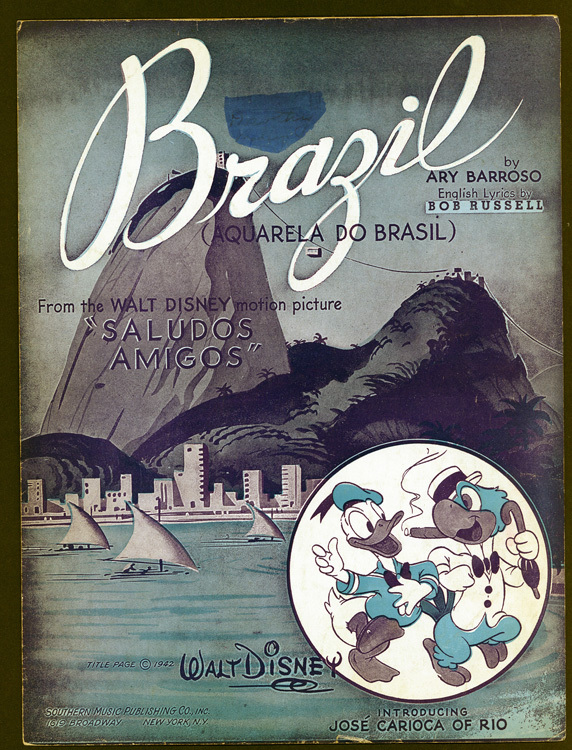 Sheet music for the song "Aquarela do Brasil" or "Watercolors of Brazil," which was introduced in Disney’s movie "Saludos Amigos." Written by Ary Barroso and performed by Aloísio de Oliveira, both South American artists, the song extolls the beautiful countryside of Brazil. Early attempts by the Office of the Coordinator of Inter-American Affairs to encourage Hollywood studios to produce films targeted at both U.S. and South American audiences had failed miserably. Instead of feel-good movies accentuating the diverse peoples, traditions, and cultures found in South America, the American film studios created movies rife with stereotyped bandits, thieves, and buffoons. South Americans found the films racist, insulting, and pandering. Hoping to smooth over relations, Rockefeller approached Disney and requested some movie shorts. By this time, both Snow White and Pinocchio had been translated into Spanish and Portuguese, and Disney enjoyed widespread popularity in South America. Walt Disney saw this as an opportunity to promote his own publicity tour. From August to October 1941, he and a handpicked team of musicians, artists, animators, writers, and soundmen toured the countries of Chile, Argentina, Peru, Bolivia, Ecuador, Guatemala, Panama, and Mexico. The group was encouraged to explore and record the geography, architecture, music, art, and traditions of the different South American cultures. They returned with an abundant supply of story lines, design concepts, and ideas for new characters. Donald Duck, who by this time had surpassed Mickey Mouse in popularity, was the obvious choice to be the star of the films. In the years that followed, the Disney studio developed books, film shorts, and comic books that celebrated the people and cultures of Central and South America.. In total Disney produced 12 cartoons, four of which—"Lake Titicaca," "Pedro," "El Gaucho Goofy," and "Aquarela do Brasil"—were released in 1942 under the movie title Saludos Amigos. In it, Donald Duck played a bumbling American tourist traveling around South America with a new friend, José Carioca, a Brazilian parrot. The film was an overwhelming success in both North and South America. 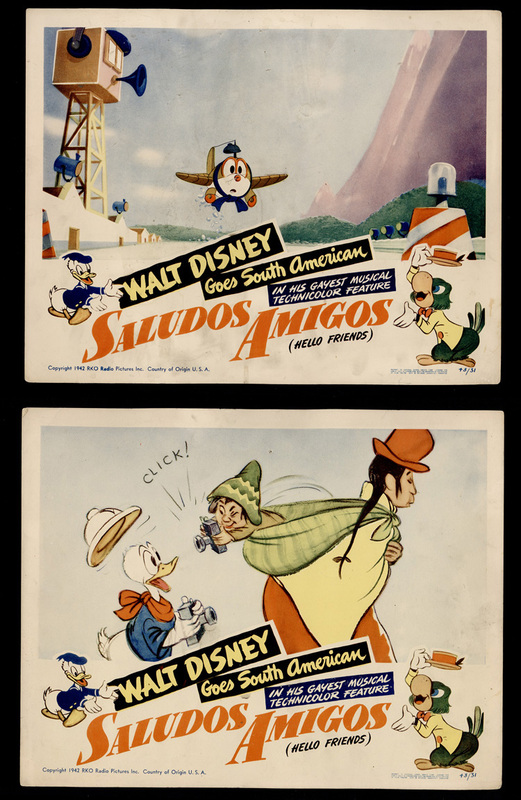 These are lobby cards from the Disney movie "Saludos Amigos," or "Hello Friends." "Saludos Amigos" premiered in Rio de Janeiro in 1942 and was released to U.S. audiences the following year. A smaller version of movie posters, lobby cards (11x14) were displayed inside movie theaters to publicize upcoming releases. Produced in a set of eight, the cards included a title page featuring the stars of the film and credits, while the remaining seven cards were highlights from the movie. Two years later, in December 1944, Disney released its second South American-themed movie, The Three Caballeros, in Mexico City. The film introduced viewers to a host of new characters, including Panchito Pistoles, a Mexican rooster. The first half of the movie featured only cartoon subjects, but in the second half Disney introduced a technology called live-action animation, which included real actors who appeared alongside and interacted with the animated characters. Disney chose Aurora Miranda, a popular actor across North, South, and Central America, to play opposite Donald, José Carioca, and Panchito Pistoles. 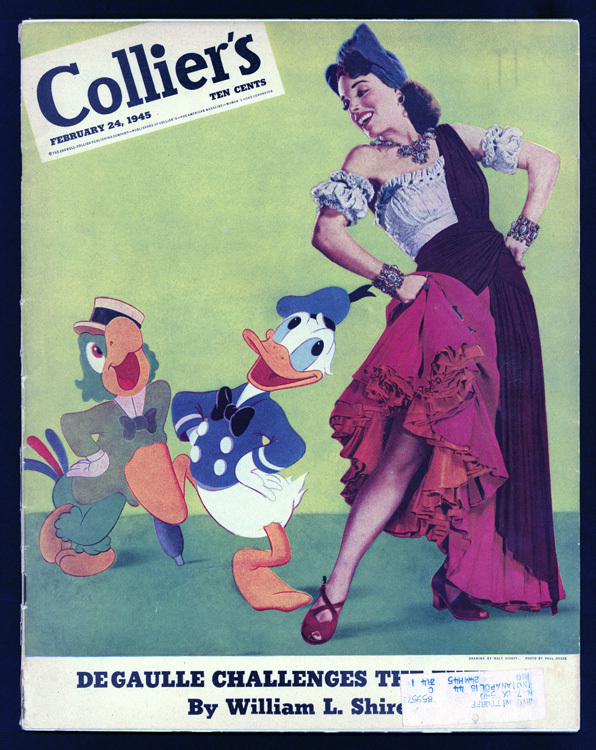 Cover of "Collier’s Magazine," February 1945, includes Aurora Miranda, Donald Duck, and José Carioca from Disney’s second South American-themed movie, "The Three Caballeros." Following Donald Duck on a tour of South and Central America, the film introduced new characters such as Aracuan Bird; Flying Gauchito with his donkey, Burrito; Panchito Pistoles, the Mexican rooster; and the Cold-Blooded Penguin. The success of these films suggests that Disney’s promise of a new version of the Good Neighbor Policy worked. North, South, and Central Americans welcomed Donald Duck and his crew of creative characters, and Roosevelt’s work to foster "international good-will and cooperation" were realized. Who would have guessed that the Good Neighbor Policy would be carried out by a duck? Melodie Sweeney is an associate curator in the Division of Cultural and Community Life. She has also blogged about the Marx Brothers, Rudolph the Red Nose Reindeer, and Wilkins and Wontkins.